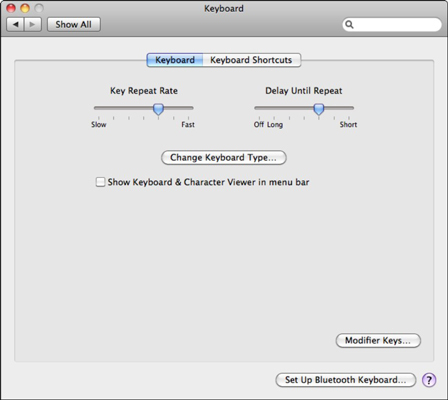 Mac OS X Snow Leopard gives you control over your keyboard preferences and how your mouse functions. Setting these preferences can help you get your system working just right for you. You Access these preferences via the system Preferences icon on the Dock. Keyboard: Move the Key Repeat Rate slider to alter the rate at which a keystroke repeats. You can also adjust the Delay until Repeat slider to alter how long a key must be held down before it repeats. If you change your keyboard, you can always run the Keyboard Setup Assistant by clicking the Change Keyboard Type button; you can also set up a wireless Bluetooth keyboard from this pane. Laptop owners (as well as Mac owners with newer Apple keyboards) can set the F1–F12 keys for applications by enabling the Use the F1–F12 Keys to Control Software Features check box. If you enable this feature, you have to hold down the Function (or Fn) key while pressing the F1 through F12 keys to use the regular hardware keys. If you have a MacBook Pro, you can choose to turn the ambient keyboard lighting on and off from this pane, or turn off keyboard lighting after an inactivity delay that you set. Keyboard Shortcuts: If you’re a power user who appreciates the lure of the keyboard shortcut, you can edit your shortcuts here. Looking for even more keyboard customizing possibilities? Select the All Controls radio button on the Keyboard Shortcuts pane to see additional keys to use. 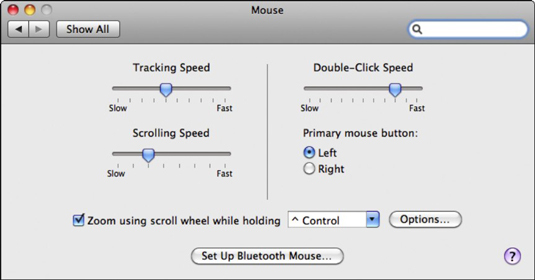 Mouse: Drag the Tracking Speed slider to determine how fast the mouse tracks across your Desktop. You can also drag the Double-Click Speed slider to determine how fast you must click your mouse to cause a double-click. Drag the Scrolling Speed slider to specify the rate at which the contents of windows will scroll. Lefties might want to change the primary mouse button for aftermarket pointing devices. You can also zoom the display with your Mighty Mouse scroll ball while holding down the key of your choice — a great option for image editing. To install a wireless Bluetooth mouse, click the Set Up Bluetooth Mouse button, which runs the Bluetooth device Set Up assistant. (Optional) Trackpad: This tab is available only to Mac laptop owners, allowing this elite crowd to customize the tracking speed and double-click speed for their trackpads. You can also set your MacBook’s trackpad for two-fingered scrolling (vertical and horizontal) and two-fingered zooming. You can also enable clicking and right-clicking by using the trackpad. Leaving the Ignore Accidental Trackpad Input check box enabled prevents spurious movements and clicks and, if you use a mouse with your laptop, you can elect to disable the trackpad while the mouse is connected. This helps to prevent accidental copies or moves within a Finder window! (Optional) Bluetooth: If you’re using a wireless Bluetooth mouse or keyboard, you can check the battery level on these devices from this panel. You can also specify whether your Bluetooth keyboard or mouse wakes your Mac from sleep mode. If you don’t have a Bluetooth card or external adapter, this tab doesn’t appear.